Beautiful map depicting New York City and Vicinity. 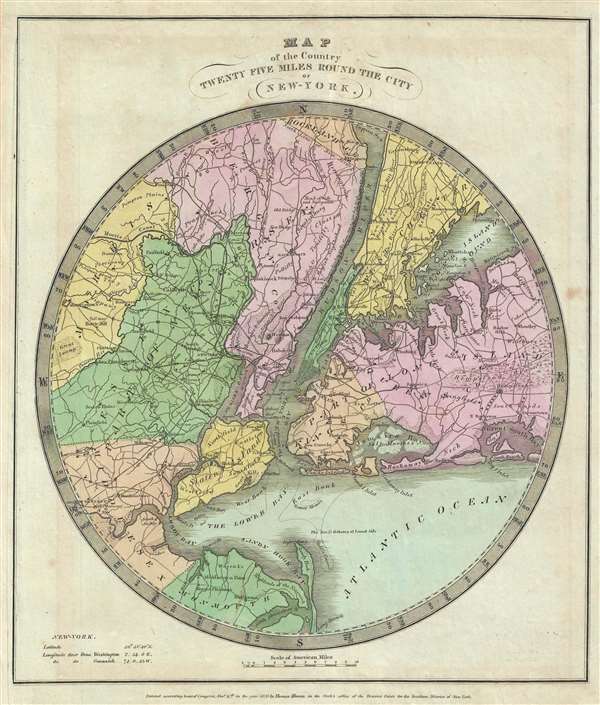 Map of the Country Twenty Five Miles Round the City of New York. This is an appealing 1835 first edition map of New York City and its vicinity by David H. Burr. It extends twenty-five miles around New York City, covering from Rockland County to Monmouth in New Jersey and from Morris County east as far as Hempstead. Reveals the area in considerable detail with attention to roads, rivers, swamps, bays, rivers, islands and a host of other topographical features. Some coastal features are also detailed. According to Ristow, although Burr is credited on the title page, he left this atlas incomplete. He was appointed as topographer to the U.S. Post Office, and of the sixty-three maps finally included in this atlas, only completed eight. The rest of the maps were then completed by Illman and Pilbrow in Burr's style. This map was ‘Entered according to act of Congress Nov. 11th in the year 1835 by Thomas Illman in the Clerk’s office of the District Court for the Southern District of New York’. Published by D. S. Stone in Burr’s New Universal Atlas. Very good. Minor foxing. Original platemark visible. Left side remargined. Rumsey 4628.037. Philips (Atlases) 771.